Box of Delights from Vegan Tuck Box! By now you are probably all familiar with my love of surprise packages of goodies coming through my door. Well, let’s be honest, who isn’t? 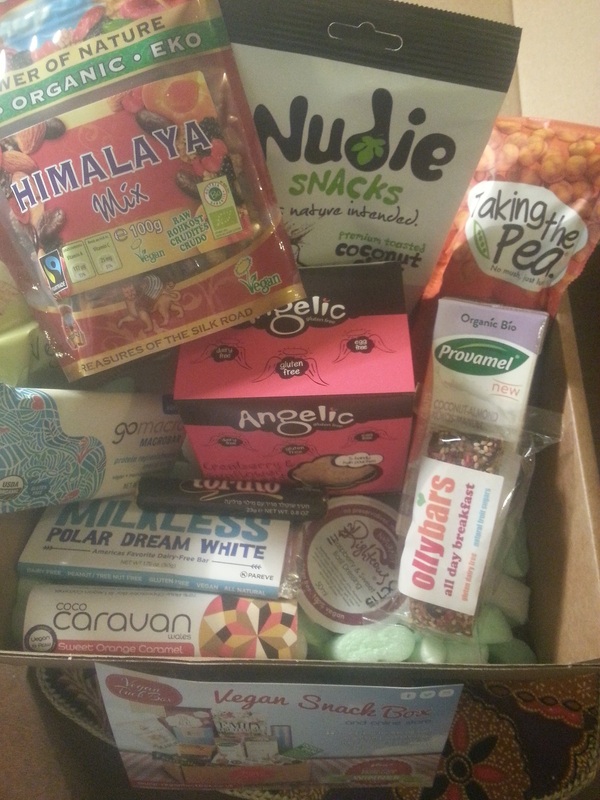 So I was delighted when Vegan Tuck Box sent me one of their amazing boxes to tuck into! Vegan Tuck Box can be ordered as a one-off or as a monthly subscription box. As the name suggests, it’s packed full of vegan goodies – treats, snacks, sweets and more. But not just any goodies – many of these are new or hard to find, and some are imported from around the globe! Starting at just £8.50 for a mini box, they’re a great way to try lots of new vegan products without having to scour the shops yourself! I was amazed at just how much was packed into the box for just £19. The value is guaranteed to be higher than what you pay – and that makes it even more of a great deal as far as I’m concerned! Everything in the box was gluten free – and there is a special gluten free box available, just in case. Once we opened up the box, it became a bit of a scramble, as my hubby got excited and mumbled – with bits of biscuit still in his mouth – that they taste like shortbread and scoffed them down. They really were scrumptious and had loads of flavour. They were packed into little packs, so if you chose to only have a few you could do so! A really unusual combination of flavours in this bar. Bitter-sweet, with a hint of orange and soft caramel. Quite satisfying and rich, even though it was sweetened only with coconut nectar sugar. I was delighted to read that all of the cacao was ethically sourced/fair trade. Thumbs up for Coco Caravan! This would make an amazing breakfast! It’s like a big bar of mushed together peanut butter, imported from the US. With 12g of protein it’s sure to hit the mark! A must for all peanut butter fans! These were absolutely lush – just gorgeous flakes of toasted coconut. They go great with my morning bowl of porridge! I would prefer it if they didn’t have any sugar added though – that would make them perfect! 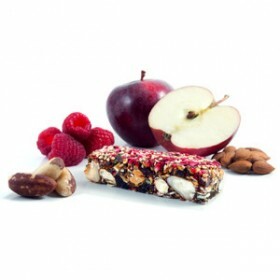 Another fantastic breakfast bar! Full of fruity goodness – really chewy and satisfying. No sugar, no additives. Perfect. This is unlike any trail mix you’ve ever had before! Packed with exotic raisins, wild almonds, rich mulberries and raw cacao beans, amongst many other tasty ingredients, this is a mix not to be missed! I was very excited to try this white chocolate, all the way from the USA. Unfortunately neither myself or my husband liked it at all. It tasted like a bar of sugar – it was basically just tooth achingly sweet without any flavour. Sorry – not for me! Wow! These were so good that when we reached the end of the packet, I was on the internet looking to see if they come in giant sharing bags! Some of the flavours too, but unfortunately this one only comes in a single serving size! These are the best flavoured nuts I’ve ever tried, and they are also baked, making them healthier! Huge thumbs up for Quibbles! The miniature pot in the main image is the raspberry dressing. I have mixed feelings about this one. I found it a little too rich and perhaps slightly too sweet for my preferences. I think it’s a personal thing and if you’re a fan of sweet, fruity salad dressings, then this is definitely one for you! A simple and tasty mix of hand-cooked carrot, parsnip and beetroot crisps. Very tasty and not over salty. Another incredibly tasty and more-ish snack. Yum! Lovely crunchy chickpeas, with a flavourful yet not overly spicy sweet-chilli flavour. The perfect protein snack. A much healthier alternative to crisps! A little bar of praline heaven! Truly delicious. It’s just as well this came in a small bar and that they are fairly hard to get (unless you order a pack of 5 from the Vegan Tuck Box website that is) otherwise I’d kiss goodbye to my low sugar intake! For me, great as a treat, but definitely a sugar high! An absolutely gorgeous blend of organic coconut and almond milks. I could easily have finished this on its own, but I decided to add what was left after my tasting to a smoothie. Gorgeous. Really rich and creamy. So, there we have it! Only one product I didn’t like at all. How great is that! I’d definitely recommend Vegan Tuck Box to anyone. However, since I’m now trying to avoid refined sugars as much as possible, it would be amazing to see the introduction of a sugar free box alongside the existing range. It would be great for diabetics, or anyone reducing their sugar intake. And don’t forget, if you’re not ready for the giant box, you can always buy a smaller one. Or you can purchase most of the products individually on the website, as well as many more. Go check out Vegan Tuck Box for yourselves! Vegan Tuck Box sent me this product free of charge for review purposes. All opinions are my own. Previous Post The Wonders of Veganuary – Vegans making Vegans!